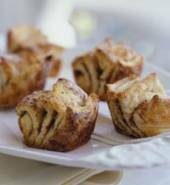 An unusual configuration makes these light-as-air sweet breakfast rolls an attractive opener for your feast. Preheat oven to 450 degrees F. Stir together flour, baking powder, cream of tartar, and salt in a large mixing bowl. Cut in shortening until mixture resembles coarse crumbs. Make a well in the center; add milk. Stir just until dough clings together. Knead dough gently for 10 to 12 strokes on a lightly floured surface. Divide dough in half. Roll one portion into a 12x10-inch rectangle. If desired, sprinkle sugar and cinnamon over rectangle. Cut rectangle into five 12x2-inch strips. Stack the strips one on top of the other. Cut into six 2-inch-square stacks. Place stacks, edge-side down, in greased muffin cups. Repeat with remaining dough. Bake in preheated oven for 10 to 12 minutes or until golden. Serve warm. i like this bread so much, yummy! !